For the third straight year, 2K Sports' NBA 2K series has remade its control set, which imposes a learning curve on everyone—even the series' most dedicated players. The game's lead gameplay designer called the repeated changes "kind of regrettable," and "something that I'm a little embarrassed of" in a podcast today. "That's kind of regrettable to be honest with you, we don't want to change it every year," Visual Concepts' Mike Wang told Rich Grisham in a one-on-one interview for Operation Sports' Press Row Podcast. (32:30 mark of the link). Wang said that, returning to the NBA 2K development team after a 1-year stint with the last NBA Live product to ship in 2009, he preferred to put the game's "Isomotion" ballhandler controls on the right stick, but also wanted shooting controls on the right stick. The process of integrating both actions—which have numerous variants—on the same analog stick took a few years, and that is why you've seen fundamental changes to the commands each year, going back to NBA 2K12. "The idea going into 13 was trying to build what we actually shipped in 14," Wang explained. 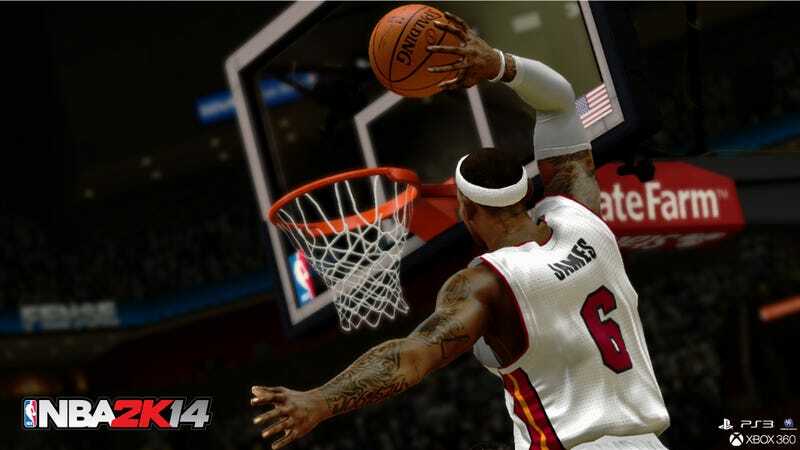 NBA 2K13 used a left trigger modifier to differentiate the shooting/ballhandling controls on the right stick. This year, they figured it out, making flick or tap commands on the stick applicable to ballhandling moves, and holding the stick in a certain direction correspondent to shooting. "After an entire year of iteration and trying to solve the problems of putting two major mechanics on one stick without modifiers, it wasn't ready [for NBA 2K13] so we took the plan B route," Wang added. "14['s controls] is what we really wanted it to be." Wang discusses other details of the latest release—including why past modes such as "The Jordan Challenge" and "NBA's Greatest" have not appeared in succeeding versions of the game— in an hourlong conversation. Listen to it on Operation Sports or subscribe to it on iTunes.